Obviously, the game follows the same format as the original. 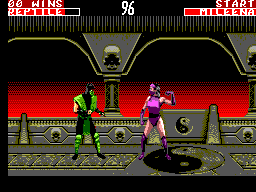 You are entering a fighting tournament and must fight through several rounds to become champion. 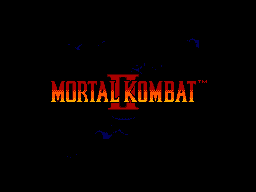 MK2 has even added some new fatality finishing moves such as an uppercut to throw your opponent up onto spikes suspended from the ceiling. Unfortunately, it's all the same as the original except simply put - just not done as well. The game doesn't seem to flow as well as the original and nothing has been added of any significance to make the game an improvement. Don't get me wrong, two player mode is still a great laugh, but you do seem to find yourself more frustrated than satisfied at times when playing on your own. 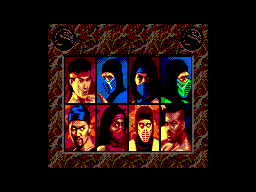 The graphics were another disappointment in MK2. Although the main character sprites are still big and bold, the movement is terrible - it just feels a lot more jerky than the original and when jumping towards your opponent the mid-air summersault just leaves your character looking like a mess of arms and legs. The look of the graphics when playing is more like a series of stills as opposed to a fluid animated game. The backgrounds aren't great either - the spikes used for fatalities on the ceiling are simply different length lines (you can see in the provided screenshots what I mean), and don't resemble spikes in any way, shape or form. The rest of the backgrounds just seem a bit bland. Basically, the attention to detail from the original game seems to have completely vanished. Sadly this is a trend that would seem to affect a lot of Master System games from around 1994 onwards. The controls are fine - a lot of the same moves from the original game and the same buttons do the same things. Unfortunately, once again it seems like the programming has deteriorated though, as the controls do appear to be a little less responsive, and some of the same moves from the original game are actually a little more difficult to administer. A lot of the time I find when trying to jump towards your opponent, you simply jump vertically allowing your nemesis of the moment to simply move forward and hit you! One of those 'bite the control pad' moments that will happen again several times during a lengthy gaming session!